Welcome to my website where you will discover publications and events that I am participating in. In 2006 I was invited to give a talk on my personal involvement with family history at the Melbourne Writer’s Festival. The event was held at the historic Melbourne Athenaeum which celebrated its 170th anniversary in 2009. To learn how I became hooked on tracing my own family history, have a look at All In The Family: Researching Your Family History. 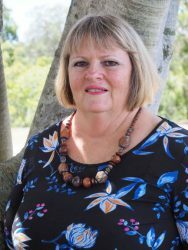 In July 2011 I started an online blog Diary of an Australian Genealogist to record my research (both here in Australia and overseas), links I like, articles or newsletters I read, family history news that excites me and so on. Shauna Hicks History Enterprises is a small personal part time business specialising in local and family history research. Established in August 2009, it seeks to assist people in researching their own family and community histories. One of the primary projects I am involved with, as lead presenter, is Unlock the Past which is a series of history and genealogy events in Australia and New Zealand. In September 2016 I was again honoured to be included in John Reid’s Genealogy Rockstars list for Australia and New Zealand. This year I was the Silver Medallist and Michelle Patient did this lovely badge to mark the occasion. See the top 10 for Australia and New Zealand here. 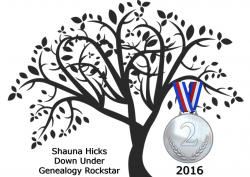 In September 2015 I was honoured to be the Bronze Medallist Genealogy Rock Star for Australian and New Zealand in John Reid’s annual survey. The to p 10 for Australia and New Zealand are here. 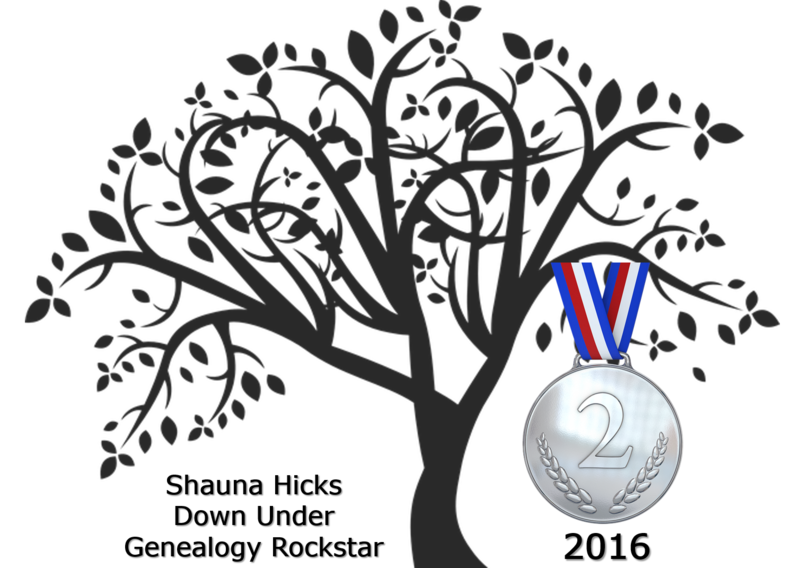 In September 2014 I was honoured to be the Gold Medallist Genealogy Rock Star for Australia and New Zealand in John Reid’s annual survey. The top 10 for Australia and New Zealand are here. Also in September 2014 I was thrilled to receive a One Lovely Blog Award for both SHHE Genie Rambles and Diary of an Australian Genealogist. My response for Rambles is here and the response for Diary is here. In 2013 I was honoured to have my blog Diary of an Australian Genealogist listed in Inside History Magazine‘s top 50 genealogy blogs. There are some great bloggers in the list which you can see online here. Diary has also been selected for permanent preservation by the National Library of Australia in their Pandora web archive. 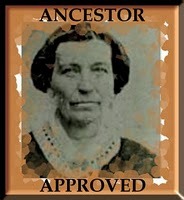 I was delighted to be nominated for an Ancestor Approved Award and you can read all about it here. As part of my response I listed ten websites that I believe researchers should be aware of, so please have a look. I love getting feedback from people, both the positive and the not so positive. Most of it is anonymous so I can’t personally thank or reply to anyone. The not so positive usually relates to how fast I speak, how much I cover in talks, longer question time, and the need for handouts or copies of talks so that they can go over what I have covered again when they get home. This is why I now put copies of my presentations on the Resources page of my website.